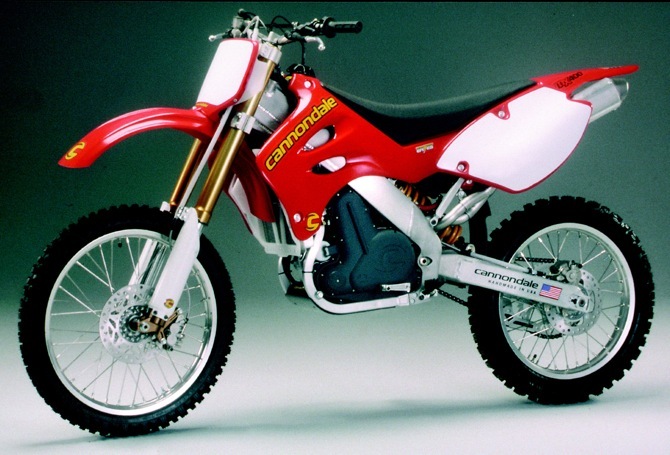 Throughout the history of dirtbikes there has been many weird and wonderful ideas and inventions, some groundbreaking, some misunderstood and some just down right terrible. Over the coming weeks we decided to cover some of the more interesting and obscure machines that have graced our tracks and loops over the years. This week we will start with the enigma that is the Cannondale E440. In early 2001 the famed bicycle manufacturer Cannondale was primed to set the world on fire with the release of the ground breaking MX400. In a world where 2 strokes were still king of the hill and the best 4t on the paddock was the ill handling, over powering, hard to start YZ426 from the likes of Yamaha, the world waited with baited breath. The MX400 featured a 400cc DOHC 4 valve engine. The first radical change made to the motor was it's rear facing exhaust. From an engineering point of view this makes perfect sense. The bike moves forward, air is forced in the front, exits out the rear, creating a syphon like effect. It also created extremely hot exhaust header that was void of any cooling airflow due to its position, tucked under the seat. The next thing on the list was to do away with the traditional linkage style rear end hence eliminating additional parts and bearings, makes sense right? less parts, less weight, less maintenance? All of the above are correct but it came at the price of giving the bike a quirky rear end rendering most peoples suspension tuning knowledge back to square one again. So what else could have they done to rock the boat I hear you say. In a world of carburettors and jetting kits, the MX400 rolled out with fuel injection as standard. The fuel injection was however suspect to say the least. Floating idle speeds, running on after shut off were some problems to name a few. As 2002 rolled on a few of the injection issues had been addressed, displacement was increased to 432cc and enduro versions of the bike were released. Unfortunately for Cannondale, the bike was so badly received that the damage was done. No matter how well they developed it, the bad reputation could not be rectified. They continued till 2004 and folded the motorcycle division of the company. Looking back at the 440, it was really too far ahead of its time. What would it be like today if it had continual development? The link less rear end has become a trademark of KTM bikes and remains one of the dividing factors between them and other brands. The reverse facing cylinder was introduced on Yamaha's YZ models in 2010, some 9 years after the 440 was introduced with it. Electronic fuel injection has only crept into motorcycles in the past few years also. Its high mount un conventional air filter position near the fuel tank is also becoming more common. All this being said, the Cannondale was a glimpse into the future, and the community laughed at it for being different and trying new things. It may be the Cannondale that has the last laugh from its grave as the dirt bikes of today are built in its image.